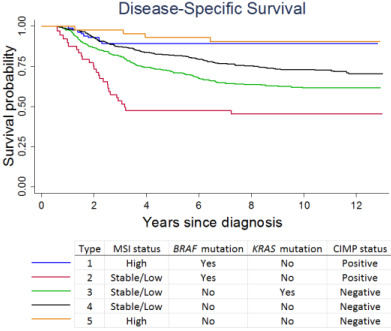 Kaplan-Meier survival curves showing the disease-specific survival of colorectal cancer patients by molecular subtype, as defined by the status of four molecular markers: microsatellite instability (MSI), BRAF, KRAS, and CpG island methylator phenotype (CIMP). Colorectal cancer (CRC) can arise through several different biological pathways, which can be characterized by different combinations of genetic and epigenetic changes within the tumor. These different pathways may influence tumor characteristics, such as cancer aggressiveness, which in turn can affect patient survival following diagnosis and treatment. While previous studies have considered various markers of tumor characteristics by themselves, a more comprehensive evaluation of the association of molecular subtypes for CRC survival was needed. In a recent report in Gastroenterology, Drs. Amanda Phipps and Polly Newcomb, together with colleagues in the Public Health Sciences Division, combined four molecular tumor markers to evaluate five different CRC subtypes, and found marked differences in survival. The motivation for this study came from recent successes in personalized and precision medicine in other areas of oncology. "Over the past few decades," said lead author Dr. Phipps, "we've seen leaps forward in terms of the development and availability of targeted cancer therapies - therapies that allow us to more effectively treat different patients with different subtypes of a given cancer. Still, there is very little in the way of targeted treatment options for patients with colorectal cancer." By demonstrating that differences exist between CRC subtypes, the authors hope to encourage the development of personalized treatment therapies that can improve outcomes for this common cancer. To evaluate these CRC subtypes, the authors evaluated over 2,000 paraffin-embedded formalin-fixed diagnostic tumor tissue specimens from participants in two Seattle-based studies: the Seattle Colon Cancer Family Registry and the Postmenopausal Hormones Supplemental Study to the Seattle Colon Cancer Family Registry. These tumor samples were then assessed for each of four molecular characteristics that reflect different molecular changes in the tumor: microsatellite instability status (MSI; stable/low/high), BRAF V600E mutation (yes/no), KRAS codon 12 or 13 mutation (yes/no), and CpG island methylator phenotype status (CIMP; positive/negative). Each tumor was then classified into one of five tumor types according to the combination of these four subtypes (see figure). Using outcomes data obtained from linkages to the SEER cancer registry (Surveillance, Epidemiology, and End Results program) and the National Death Index, the authors then evaluated the association between these CRC subtypes and both overall and CRC-specific survival. Compared to type 4, the most common subtype of CRC, the authors found that the mortality rates were higher for subtypes 2 and 3 and lower for subtypes 1 and 5. The highest CRC-specific mortality was found for type 2 tumors (hazard ratio = 2.20, 95% confidence interval = 1.47 - 3.31), while type 5 tumors had the lowest CRC-specific mortality (hazard ratio = 0.30, 95% confidence interval = 0.14 - 0.66). Associations with overall mortality were attenuated but similar. Together, these findings suggest a complex interplay between these molecular markers, tumor subtype, and survival outcomes. "Our results illustrate that not all colorectal cancers are created equal," said Dr. Phipps. "There are dramatic differences in the survival outlook for patients with the different colorectal cancer subtypes we explored. We hope these survival differences will motivate and guide the development of more targeted treatment options for patients with colorectal cancer." Now that survival differences by CRC subtype have been identified, the next step will be to study the biological mechanisms that drive these differences. "Although we can very clearly see differences in survival across the subtypes of colorectal cancer we evaluated, what is driving these differences is not yet clear," said Dr. Phipps. "We would like to better understand how these different tumor subtypes differ in terms of their responsiveness to cancer therapies, how often (and when and where) they metastasize, and how patients with these different subtypes of disease differ in terms of their lifestyle patterns and underlying health. We’ve identified a pattern - the next step is to understand the basis for that pattern." Other PHS investigators contributing to this project were Drs. Andrea Burnett-Hartman and John Potter.